Frequency separation is a powerful retouching technique for improving a portrait subject’s skin quality without the risk of looking overly retouched. 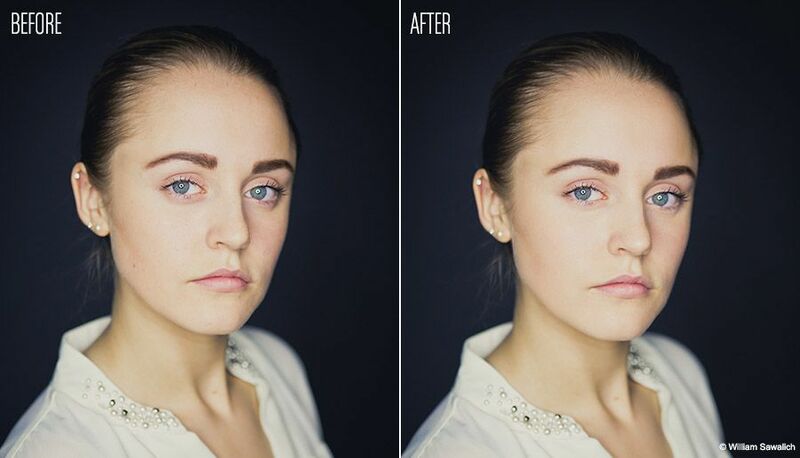 You know what an overly retouched portrait looks like, right? The subject’s face seems nice and clear, but when you look a little closer, it appears their skin tone has been sprayed on with paint or perhaps obliterated by blur. The only thing worse than a non-retouched portrait, in my opinion, is one that has been retouched with a heavy hand. While frequency separation may be a high-end technique used by professional retouchers working on beauty ads and fashion magazine covers, it’s actually quite straightforward and easy to do. With the Low layer active, use the Gaussian Blur filter (found under the Blur heading of the Filter menu) to remove the detail on the Low layer. You want the filter strong enough to eliminate details of skin texture, but not so strong that the whole image becomes unrecognizable. Less is more, for sure. The resulting image will look a lot like the effect of a High Pass filter: middle gray, with subtle lines and details outlining the edges of contrast within the image. To make it look more normal—in fact, to turn it back to looking exactly like it did when you started—set the High layer’s mode to Linear Light. This effectively creates the original image again, because the combination of the High and Low layers with the Linear Light mode isolates whatever details were eliminated with the Gaussian Blur on the Low layer and puts those details alone on the High layer. You’ve just separated the color and tones on the Low layer from the details and textures on the High layer. That’s a huge help for powerful, high-quality retouching, which you now can begin. Before we begin the actual retouching, consider that the steps above are repeated the same way every time you prepare an image for frequency separation retouching. That means this series of instructions is ripe for streamlining with a Photoshop Action. Lots has been written on creating Actions, but know that it’s fairly simple and straightforward: you simply press Record on a new Action, then run through the setup steps above, and click Stop when you’re done. The Action then will play with a single click and turn any image into the layered variation with the texture and tones separated onto different layers, ready for retouching. For the actual retouching, I start with the High layer and a Clone Stamp tool. Yes, you can use a Spot Healing brush to eliminate the prominent textures of wrinkles, whiskers and blemishes, but I find that the Clone Stamp works better because it replaces a bad texture (a blemish) with a good texture (normal pores). After a once-over, I like to click off the viewability of the Low layer in order to see the exaggerated texture produced by the High layer over the original background layer. This is a helpful way to see even the smallest wrinkles and blemishes as they’re amplified before your eyes. Once I’m satisfied that the High layer is fairly free of unappealing textures, I turn my attention to the Low layer. Clicking the layer to make it active, I then choose the Brush tool. I can make spot-color fixes this way by using a large, soft brush set to a very low opacity and flow (about 25% each). Alt-clicking on a pleasing skin tone establishes that color in the foreground palette, and painting with the brush then applies that tone to the Low layer. This is a great way to eliminate any imperfections from discoloration, shadows or just blotchy skin. The more profound way to improve skin tones, though, is to use the Lasso tool to select large swaths of skin—say, the cheek, the chin or the forehead. With an area roughly outlined with a selection, you then want to modify the selection by feathering it, about 50 pixels or so. With an area selected and the edge of that selection feathered, you can type Command (or Ctrl) F to apply the last filter, which is the Gaussian Blur. (You also can find this command right at the top of the Filter menu.) I repeat this process on various planes of the face—chin, forehead, cheek—each time selecting, feathering and blurring. This, too, is an ideal opportunity to record a Photoshop Action; it even could be tied to a function key so your process becomes even simpler. For instance, draw a Lasso selection and hit F5 to feather and blur all at once.